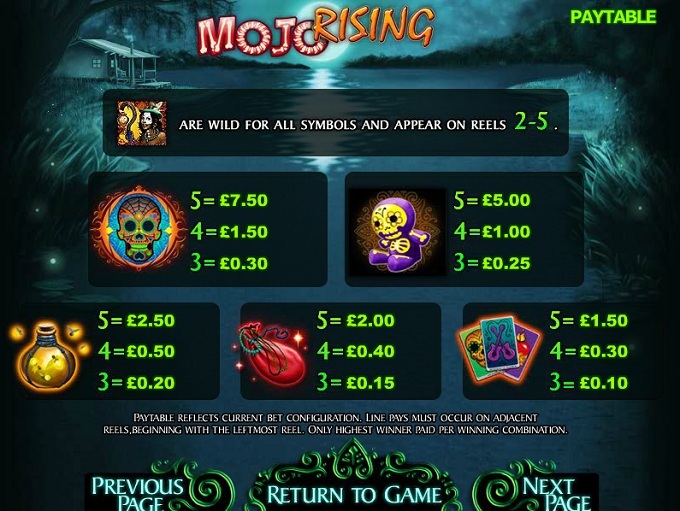 In Mojo Rising, the player will discover a game with an influence that comes from the Voodoo religion and from the kind of swamp region where the animals shown inside are living. The game’s dark graphics will make it actually quite appropriate for the task it undertakes, and they’re excellently handled, so chances are that you’re going to enjoy playing on it. The game is a WMS creation. 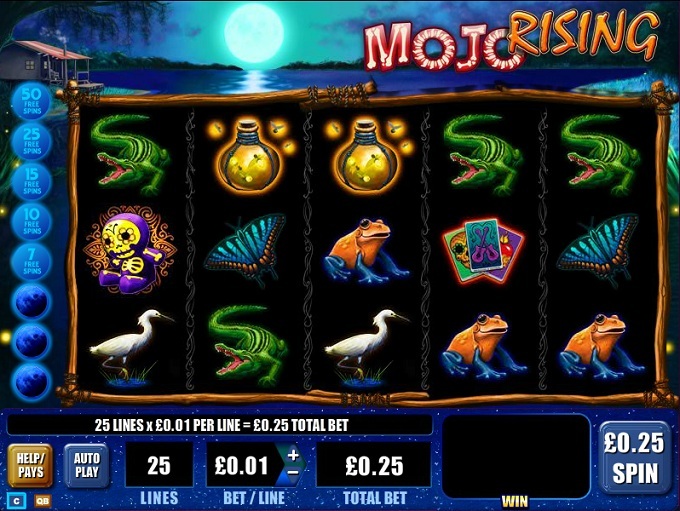 Mojo Rising provides you with a 5 reels layout, with 25 paylines and with a mix of cascading reels, free spins and wilds as its features. The best prize it advertises reaches a value of $3,750. There are two types of features that are common in this slot, the free spins and the wild, with the cascading reels being the one that is somewhat unusual. Cascading Reels are used in a number of other slot machines, quite a few from WMS, but they’re not widespread. This feature allows symbols which form combinations to cascade off the screen, and for new symbols to come in and take their place. This happens after the prizes are offered, and the new symbols get a chance to form combinations as well. The cascading reels can keep happening until the new symbols no longer bring you wins. The wild symbol’s representative is a man with white make-up on his face, looking like a Voodoo priest. The game uses the wild only for the purpose of creating new combinations through its substitution ability, without the possibility of making its own, the reason being the presence of this feature only on reels 2 through 5. 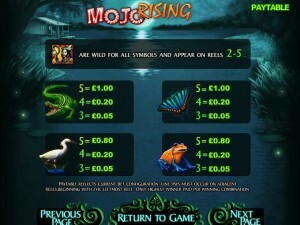 The game has free spins to give you as well, but they don’t have a scatter symbol to get them started. Instead, the slot counts the number of times cascading reels are triggered in the same spin. 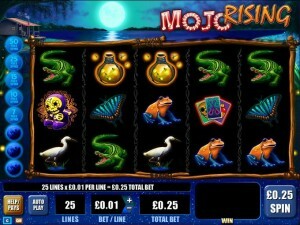 If you get at least four consecutive wins from the same bet, then you get the minimum of 7 free spins. 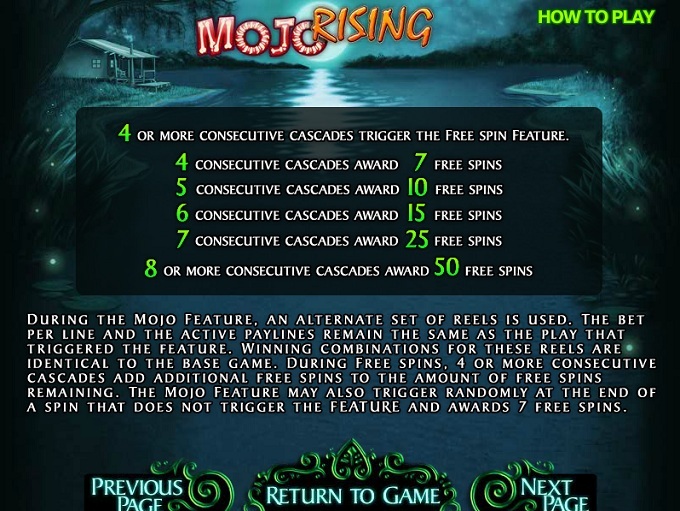 The number continues to go up with each new consecutive cascade, so 5, 6, 7 or 8 cascades will bring you 10, 15, 25 or 50 free spins, respectively. 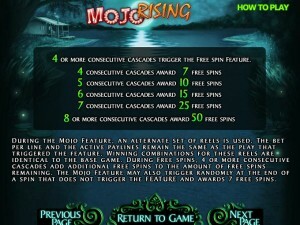 To retrigger the free spins, you need the four or more consecutive cascading reels again. If you take a look at the betting options, you will notice that you can’t modify the number of active lines, all 25 are used, but that the line bet is the one you can work with. The betting range of $0.25 to $125 is possible thanks to the line bet of $0.01 to $5. To get the big prize, you need the 750 coins which the game can give away, the value reaching $3,750. The game’s dark atmosphere suits it perfectly, especially since the Voodoo theme is present as well. The action seems to take place in some kind of swamp area, with alligators, frogs, birds and butterflies being the creatures that have found their way onto the symbols, the rest of the icons offering cards, Voodoo dolls and other similar objects. The quality of the design is excellent, and in the background image you see a house next to a lake/swamp, with a big full moon in the distance. Symbols: Voodoo Man (wild), Skull (750 coins), Voodoo Doll (500 coins), Fireflies Light (250 coins), Red Bag (200 coins), Cards (150 coins), Alligator (100 coins), Butterfly (100 coins), Bird (80 coins) and Frog (80 coins). The theme and the design which is based on it are darker, so if you’re in the mood for something fun it’s not the slot to go after. It’s perfect for a Halloween day slot machine though. This Mojo Rising slot is offered by all online casinos with WMS software, playable either in practice or in real money mode.